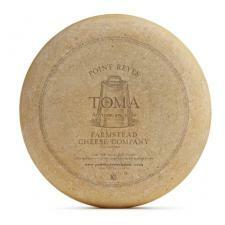 TOMA – a Classic Italian, cows’ milk cheese made by dairy farmers, now has a California cousin. Using milk produced on their 3rd generation dairy farm, from cows that graze on Certified–Organic pastures, the Giacomini family has created a truly unique farmstead table cheese. The buttery flavor and subtle, grassy – tang finish make Point Reyes Toma perfect for snacking or melting into your favorite dish. Using round-edged Gouda-style molds for the cheese and a Gouda technique known as curd washing - draining whey from the fresh curds and replacing it with fresh water-which limits the acid development and yields a sweeter cheese. After a two-day brining to season the cheese, the wheels start their aging process. They develop a thin, hard rind, and a smooth, creamy, semifirm to firm interior with a straw color and the seductive scent of warm butter. The texture is open, with many cracks and small eyes, and the finish is sweet and buttery, with a grassy-tangy finish. Applications: Great as a stand-alone table cheese, for melting into pasta or risotto, in grilled cheese sandwiches and for grating on top of grilled vegetables, burgers or soups. Lagunitas Brewing Co.'s Hop Stoopid Ale, a highly hopped brew that is Toma's ideal companion. Certified Kosher by the Orthodox Rabbinical Council of San Francisco. Toma is an Italian word for a cheese made on the farm that produced the milk.